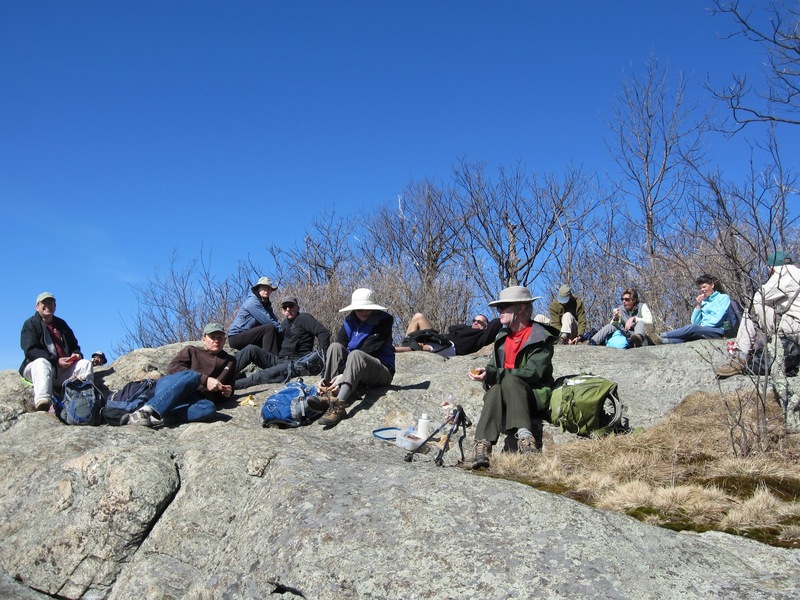 Today’s hikers enjoyed a double treat: the chance to hike in February without a coat and to hike with PATC-Far North member Eric Bredo, who now lives in Toronto. 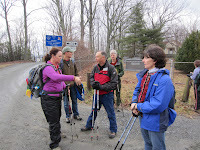 Eric and Susanna Keller, who also joined us today, both formerly led hikes for our chapter. We divided into two go-straight-home cars and one stop-at-the-brewery car. The latter was dubbed “the beer car,” eliciting the observation from Eric that the club really had changed since his departure 2 years ago. 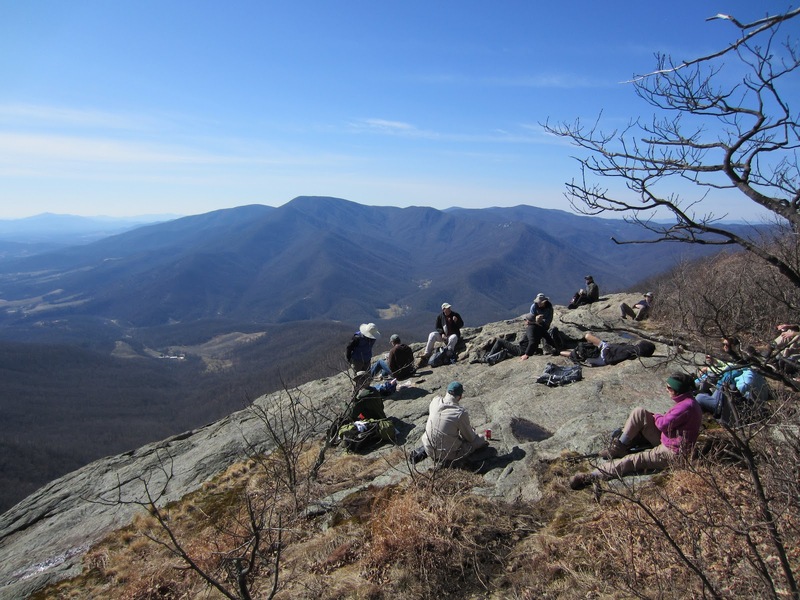 We met Ken & Marie Moss at Reed’s Gap, bringing the number of hikers to 15. 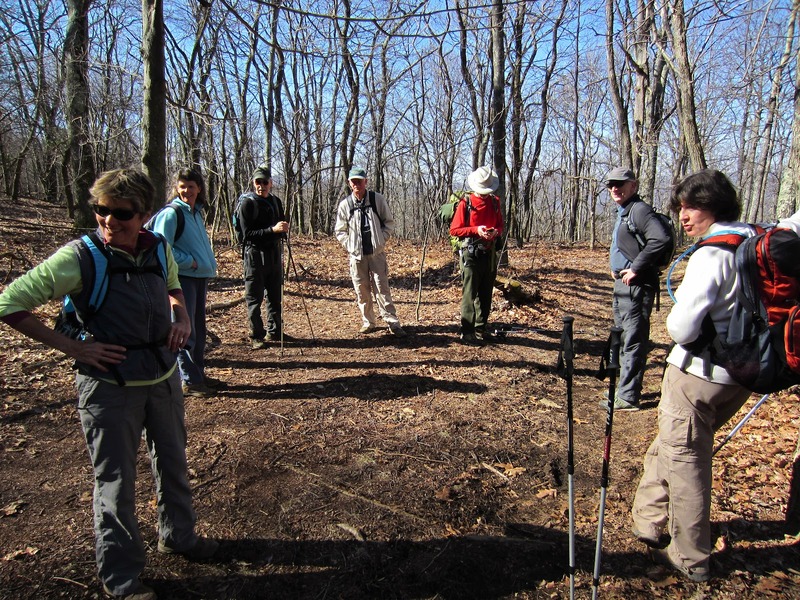 We set out on the Appalachian Trail, and a long uphill section early on served as an effective warm-up. 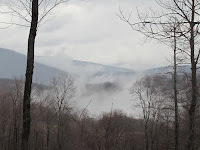 The route afforded some nice views. The overlook where we stopped for lunch offered spectacular views of the Tye River Valley and the Priest, though we had to contend with some wind. 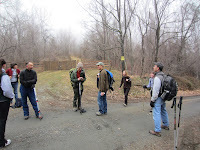 To make up for the wind, hike leader John Shannon passed around our favorite Breadworks treat (pumpkin bread), and Bill Holman shared chocolate. 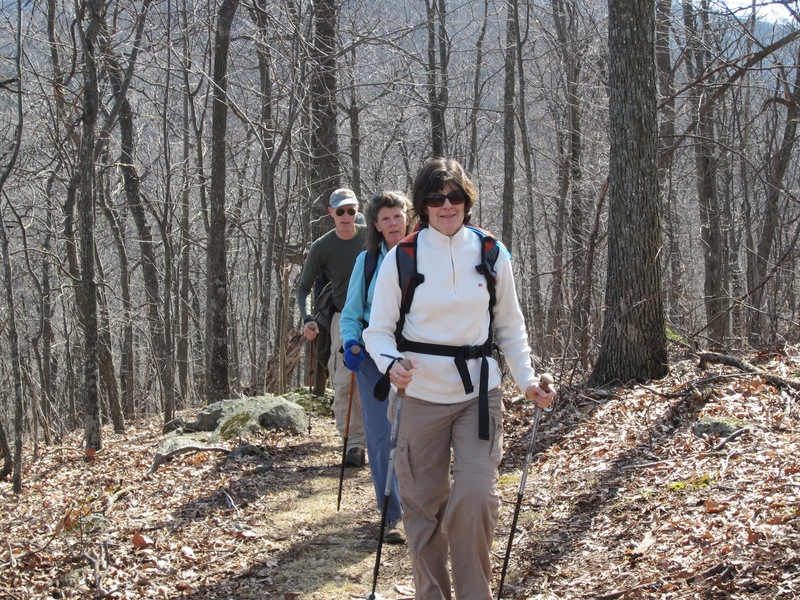 After lunch, some hikers headed back (Susanna, Ken & Marie, Bill, Don Davis, Sue Tansey, Brian Muszynski) while some headed toward the summit, another 0.6 mile further (both Johns, Dave Borszich, Marian Styles, Dan Funkhauser, Joanne & Maynard Davis). 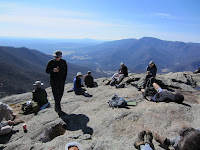 Eric walked partway to the summit, and John Brandt made it to the summit then ran back fast enough to catch the beer car before its departure. 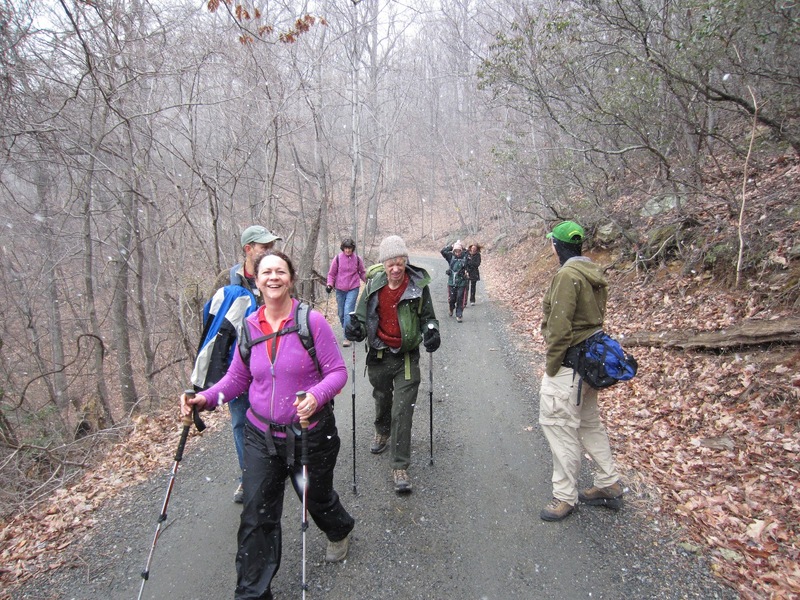 We heard that Iva Gillet, who had been up at Crabtree Falls, joined the members of the beer car for a stop at Devil’s Backbone Brewery. 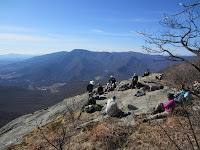 Hikers who went straight back from our lunch overlook covered about 8 miles, and hikers who went to the summit covered about 9.5 miles. 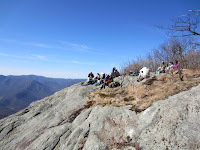 The summit afforded a wind-free viewpoint, which was especially nice. The non-refreshment-stopping cars pulled into the Albemarle High parking lot at a respectable 4:30 p.m., and we found that returning via Route 151 takes about the same time as the Blue Ridge Parkway-I64 route. 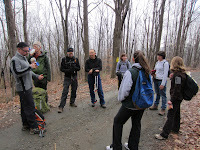 For the 3rd annual soup hike, the weather forecast was more threatening than Nature delivered. 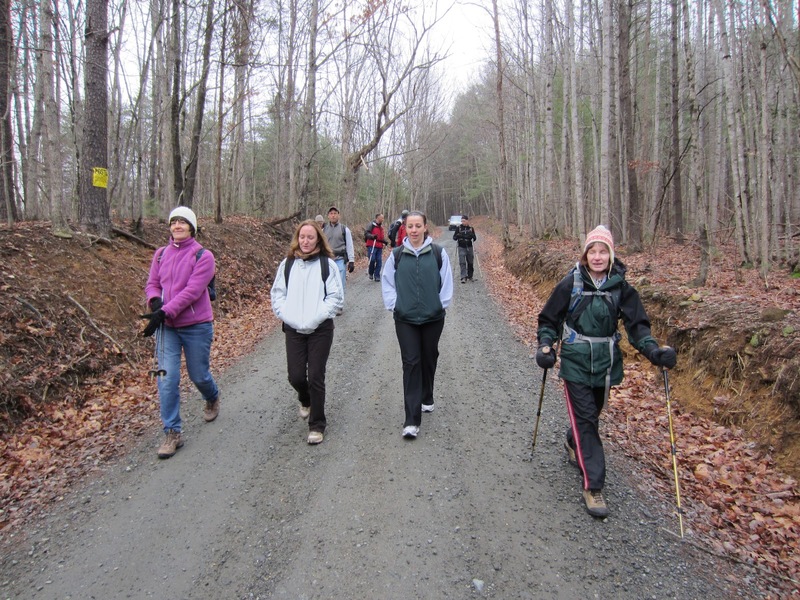 A small gathering, by comparison to previous years, our group of 17 assembled at AHS, picked up a few others at Briarleigh Farm, and then proceeded to the intersection of Bacon Hollow Road and Brokenback Mountain Road. David Ledbetter, Brian Muszynski, and first time hiker Corina Grendron sped ahead with Corina’s co-worker Dan Ralston struggling to keep pace. 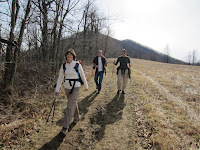 We proceeded up the infrequently used, winding, gravel road for 2 miles, stopping as needed as the ascent was constant. Michael Seth, Don Davis and Peter Callan talked of their travels for both business and pleasure, as Peter plans an upcoming trip to Bangladesh, then on to Nepal where Iva Gillet, Dan Ralston, and Marit Gay travelled last October. 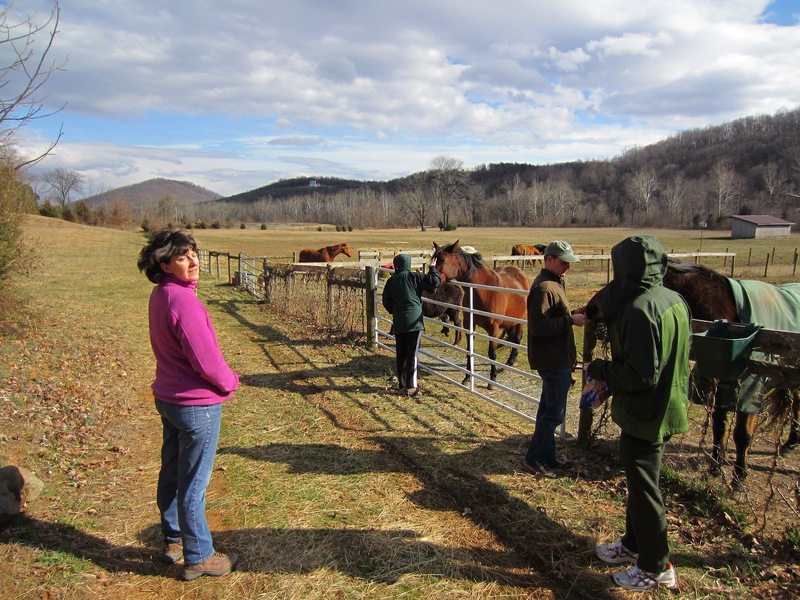 At the intersection with Wyatt Mountain Rd, we travelled toward Flattop Mtn., though stopped at the small community near Stone Mountain Vineyard. Here Ken and Marie Moss, Briana Taylor, Dave Borszich, and Andy Wilgruber admired a cemetery of the predominant families of Bacon Hollow- Shiffletts and Morrises. Returning back the way we came for a mile, the threat of rain for the day was delivered in a much more lovely form- snow! 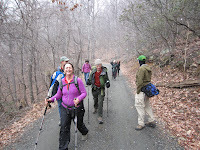 We walked for about 15 minutes in the fluffy snowflakes and while making the final decent toward Shady Grove, the sun came out. 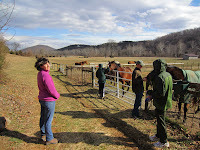 We convened into 3 cars and returned to Briarleigh Farm for soup, bread, cookies and good times. Don Davis’ corn bread and Marian Styles’ croissants were consumed along with John Shannon’s ever present special bread-of-the-hike. 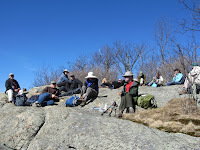 Corina added banana bread, and Leon Gorman and Wanda Hamlin joined us apres hike adding a bottle of wine. My favorite conversation was learning trivial knowledge of terminology of animal groups. Brian started it by commenting on my clowder- that turns out to be a group of cats. Don mentioned seeing a murder- that turns out to be a group of crows. Other popular groups were a crash of rhinos and a bloat of hippos. See the education those of you not present missed??? 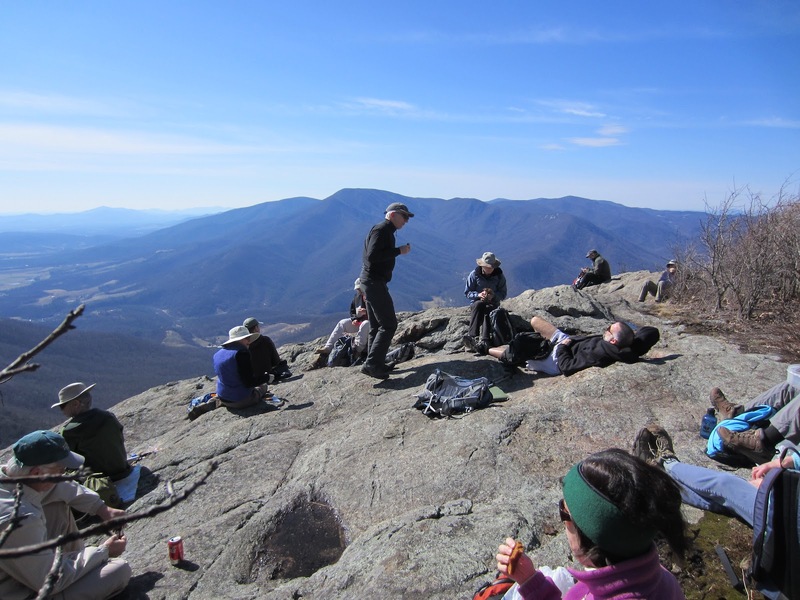 Hiking is very good for trivia! John Shannon executes some garlic mustard. 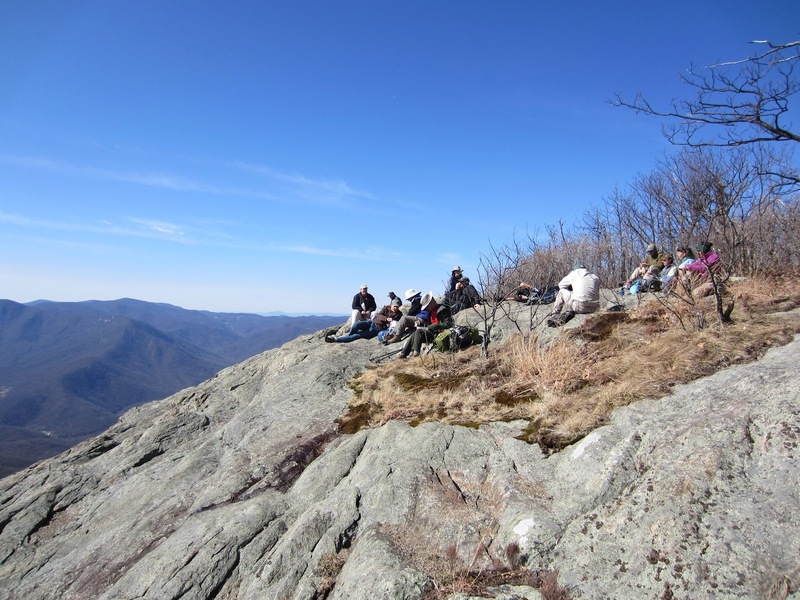 Although not as nice as the 70-degree day we had midweek, the first Saturday in February turned out to be a not-too-shabby day for a winter hike. 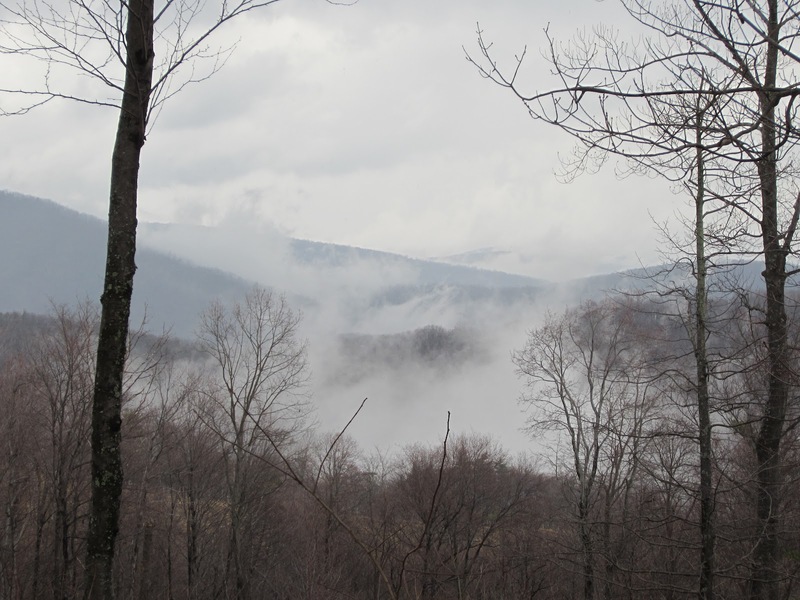 We started from Two-Mile Run Overlook, and a half-hour into our out-and-back route, coats started feeling like too much clothing. 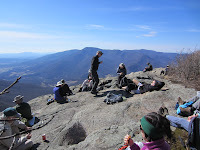 We enjoyed some lovely Shenandoah Valley vistas, and the elevation gain ensured that we earned lunch. 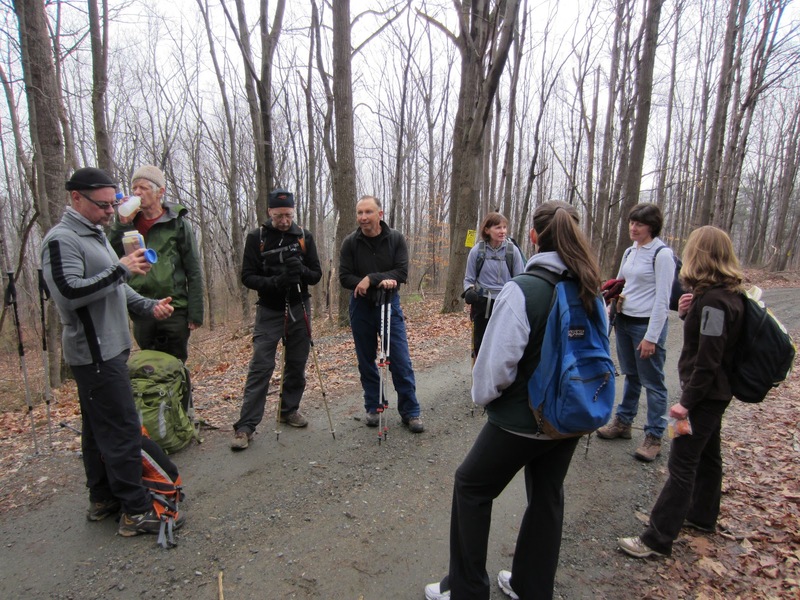 Hike leader John Shannon made sure no one went without sweets by providing pumpkin cake. Don Davis had predicted that rain would commence at 1 p.m., but he was twenty two minutes off. Shortly after lunch, a few sprinkles fell but didn’t amount to enough moisture to warrant rain gear. 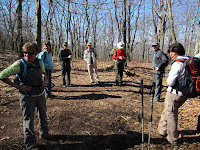 We finished the 6.8 miles (or 7 miles, depending on which source you believe) by midafternoon, leaving time for a stop at Timberwood Grill for those so inclined. 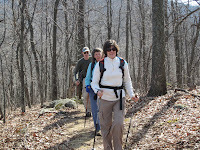 We were joined today by Barbara Shenefield, and her husband Richard Price who hiked with us for the first time. 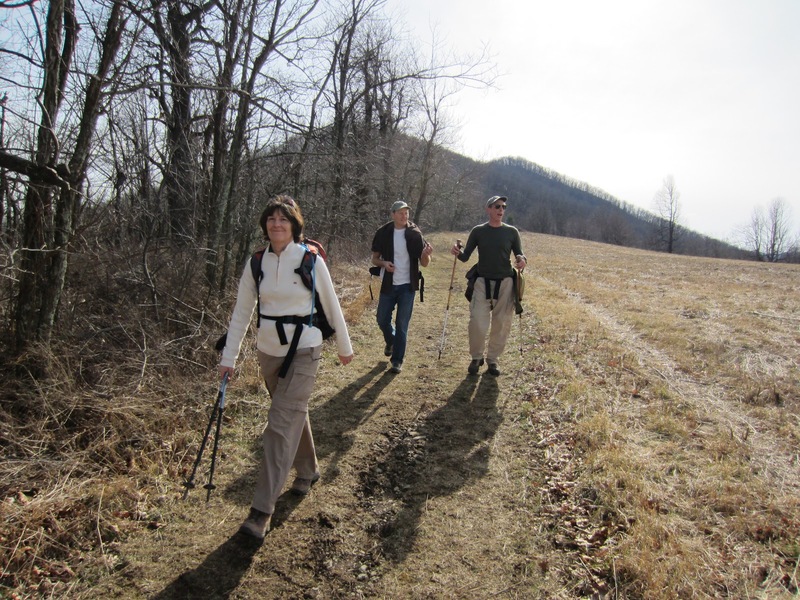 Richard and Barbara used to live in France, giving them and Ken Moss a common interest besides hiking. 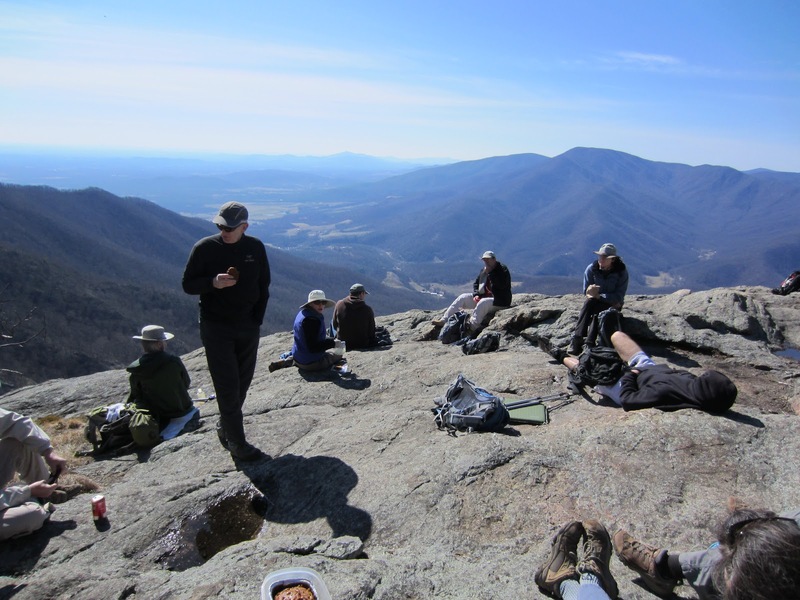 We were also joined by Southern Shenandoah Chapter’s Michael Seth, who is always a welcome addition. 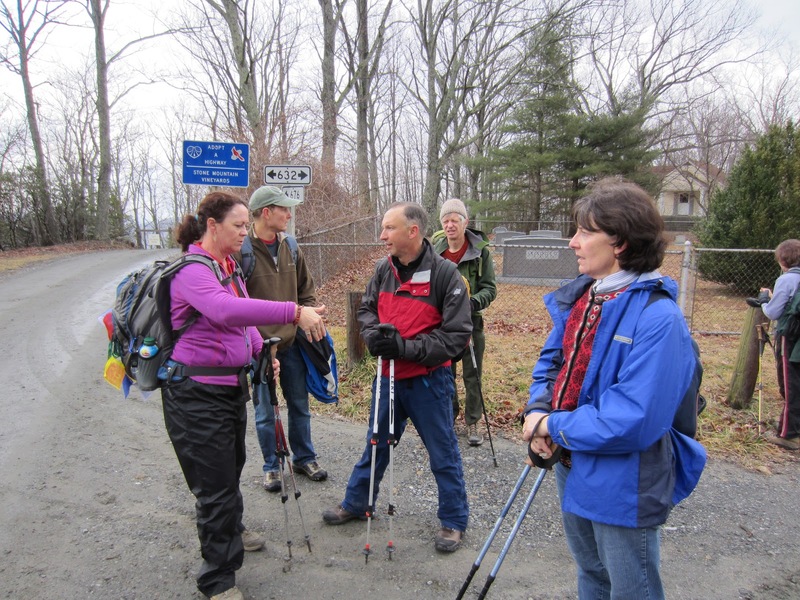 Other hikers included Sue Tansey, Dan Funkhouser, Lindsay Brown, and Marian Styles.